The second half of the home-and-home series is being played at Agganis Arena tonight, with BU looking for a sweep and Lowell hoping to salvage a split. We have links to game notes, gametracker, WWZN radio and WWZN.com. For subscribers, the game is being streamed on BU All-Access. And our friends at The Boston Hockey Blog will provide their informative and entertaining live blog throughout the game. Scott Weighart, author of "Burn The Boats," which chronicles BU's 2008-09 championship season, will be Bernie Corbett's guest between the second and third periods of tonight's broadcast on WWZN. Three former Terriers are featured in TSN’s overview of NHL rookies: Chris Bourque, Matt Gilroy and Colin Wilson. Last season, BU went to overtime five times but didn’t register an overtime win until its 45th and final game. This season, it took just four games to produce a “walk-off winner.” Once again, it came off the stick of blueliner Colby Cohen, as the Terriers scored last to take a 5-4 seesaw contest win over UMass-Lowell. A 2-1 BU lead in the second period turned into a 3-2 deficit by the end of that period. After Zach Cohen knotted the score early in the third, David Warsofsky’s (photo) second goal of the night, off an Andrew Glass feed, gave BU its third lead of the evening. Lowell responded once again late in the period to send the contest to overtime. Halfway through the extra period, Joe Pereira , hero of last week's Michigan win, drew a penalty. Coach Jack Parker, looking for the knockout punch, added a wrinkle to the BU power play positioning Warsofsky, who was the game’s first star, at left wing on Chris Connolly's line. With 1:06 remaining, Colby Cohen fired a shot just inside the left post, assisted by Captain Kevin Shattenkirk. After giving up 31 shots in the first two periods, BU tightened its defense and yielded just 5 shots the rest of the way. UML Coach Blaise MacDonald post-game comments. From the Free Press's Boston Hockey Blog, a game recap, the story behind Warsofsky's move to forward on the power play and grading out tonight's performance. Check back for more game coverage. The Terriers and River Hawks meet for a pair this weekend, their first games since BU edged UMass-Lowell, 1-0, in a hard-fought Hockey East championship game last March. Tonight, the teams face off at Tsongas Arena. • Inside College Hockey’s Jeff Howe previews this key early-season matchup. • USCHO weekly Hockey East preview. • BU game notes with links for gametracker, the Internet broadcast on WWZN and a pay-per-video Internet telecast on the B2 Network. • This week's schedule of D1 college hockey games. A Philadelphia Flyers fan blog traces the path that took Colby Cohen (photo) from Villanova, Penn., to the Terrier blueline. For All American goalie John Curry pitched his first shutout of the AHL season, in a 1-0 overtime win over Maniotoba, raising his record to 5-2.
that won the 2006 Hockey East title. Matt Gilroy is with the Rangers, Kevin Schaeffer is playing for David Quinn on the AHL Lake Erie Monsters and Sean Sullivan was just returned to San Antonio by the Phoenix Coyotes after a brief recall, but no starts. Last season, we reported that Tom Morrow was playing for Bakersfield in the ECHL. This season, he’s closer to his native Minnesota, playing for the Kalamazoo Wings. Jakabs Redlihs is playing in the Russian KHL for Riga Dynamo KHL. Teammates include his brothers Mikelis and Krisjanis along with former Maine star Marty Kariya. Kevin Kielt retired from hockey but is a seen at most Terrier home games. As BU heads into its first weekend with two conference games, WTBU’s Chris Aliano offers his take on Hockey East Power Rankings at this early juncture. The Terriers take on UMass-Lowell in a home-and-home series, beginning tomorrow night at Tsongas Arena in Lowell and concluding Saturday at Agganis Arena. USCHO offers preview of the River Hawks, whom Coach Jack Parker says should be considered Hockey East's top team as the season begins. Daily Free Press game preview. BU All Access, the weekly wrap-up of Terrier sports airs live today at Noon with junior wing Joe Pereira, who scored the game-winner against Michigan, as one of the guests. The program also will air on Saturday at 2 p.m. on WWZN, 1510 the Zone. Hockey on Campus, the online radio program hosted by Bernie Corbett and Paul McNamara, begins its broadcast season tonight and will air programs every Wednesday night through the Frozen Four in April. The program, which streams live between 7 and 10 p.m. ET at www.hockeyoncampus.com covers Division 1 and Division 3 conferences across the country as well as women’s leagues. Corbett is in his 25th season as the radio voice of BU Hockey and McNamara is a former player at Princeton and assistant coach at UMass-Lowell. The season’s inaugural program will feature interviews with the commissioners of five Divison 1 conferences: Hockey East, ECAC, Atlantic Hockey, CCHA and WCHA. Also chats with the head coaches of Union College, Miami and Merrimack. College Hockey News has an update on the injury suffered by Nick Bonino, who may be sidelined for at least 3-4 weeks. Luke Popko, who missed the Michigan game with the flu, returned to practice and is expected to suit up for this weekend's home-and-home series with UMass-Lowell. If you subscribe to the BU All-Access service on a monthly or annual basis and were required to pay an additional $8 license for Saturday’s BU-Michigan game, please contact BU Sports Information Director Brian Kelley at bkelley@bu.edu. This game was not intended to be a separate pay-per-view event. BU will look into the possibility of obtaining refunds. Thank you. Jason Lawrence, the leading goal-scorer on the Terriers’ 2008-09 team, has signed a contract with the ECHL Charlotte Checkers where he joins his former BU teammate Kenny Roche. Following Saturday’s 3-2 Terrier win over Michigan, The Daily Free Press examines the impact of BU’s four freshman forwards. All four contributed to the victory and walk-on center Ryan Santana (photo) earned some exurberant praise from Coach Jack Parker. The Free Press also looked at Kieran Millan’s strong effort in goal to secure the win. Millan, Joe Pereira and Captain Kevin Shattenkirk were recognized as top performers in Hockey East’s weekly news release. With 16 successful kills out of 17 opposition power plays, BU’s kill percentage is 94.1. Next weekend’s home-and-home series with UMass-Lowell will provide another challenge for the Terriers’ PK unit, which will be without Nick Bonino for the next few weeks due to a dislocated shoulder. The past week’s split of games with CCHA opponents dropped BU from third place to fourth in the USCHO/CBS Sports poll. Lowell, with a 3-1-0 record move up from 13th to ninth. While Bonino was in the trainer’s room Saturday night after suffering a dislocated shoulder, former BU captain Jay Pandolfo suffered a similar injury in the Devils win against the Penguins. A Hockeyfuture.com assessment of prospects in the Penguins organization commented on three ex-Terriers. ►Brian Strait: Strait, a player who played a pivotal leadership role in Boston University’s Frozen Four victory, employs a simple, defensive-oriented style of game that the Penguins are hoping will mean a quick transition to the NHL. Although he is often compared to former Penguin Rob Scuderi, Strait brings a more dynamic game to the ice than Scuderi did at the same age. While his forte is defense, Strait has a solid outlet pass, an underrated shot from the point, and is a strong lateral and backward skater. ►John Curry: The Penguins de facto goaltender if things go awry is John Curry. At 25 and in his third season in the AHL, the goaltender has nothing left to prove at the minor-pro level and is simply waiting for his chance to demonstrate he can make it in the big show. The athletic goaltender has shown good positioning and recovery. ►Chris Bourque: The Penguins group of right wingers is headlined by waiver-wire pickup Chris Bourque. A dynamic offensive player and veteran of over 275 AHL games, Bourque had made only a handful of appearances with the Penguins this season, playing mostly in a fourth-line role. At 23, Bourque has absolutely nothing left to prove at the AHL level. The question at this point in his career is whether his offensive production will carry over to the NHL level or will he be more of a bottom-six type of contributor. Jason Lawrence has signed a contract with ECHL Charlotte, an affiliate of the Avalanche and Rangers. Lawrence, who led BU in goals last season, joins Kenny Roche on the Checkers' roster. Playing without its top defensive center, Luke Popko (out with the flu), BU lost its top offensive forward Nick Bonino to a dislocated shoulder, but edged visiting Michigan, 3-2, on a late goal by junior Joe Pereira (photo). BU also played most of the final period without senior defenseman Eric Gryba due to a game misconduct penalty. The Terriers had taken a 2-0 lead on a first-period goal by Zach Cohen and a second-period score by Colby Cohen. Michigan tied the game with a pair in the third before Pereira’s game-winner. • Kieran Millan stopped 33 shots—tying a career high—including 19 of 21 in the final stanza. • With the win, BU avoided its first 0-3 start since the 1998-99 season. • The victory also brought the overall record between the teams to 13-10 in favor of the Maize and Blue. Coach Jack Parker is now 7-7 in games coached against Red Berenson. • The Terriers put in extra practice time on faceoffs this week and it paid off with 31 wins out of 63 draws. Pereira and Millan were interviewed after the game. USCHO recap. GoTerriers.com recap. Inside Hockey recap. Comprehensive boxscore. All-Access video highlights. We also have audio of the post-game players press conference with Zach Cohen, Joe Pereira, and Kieran Millan, as well as Coach Parker's comments. Blog contributor CDRAL provided a list of former Terriers in attendance for the Alumni Weekend game. It included Scott Lachance, Jim McCann, Paul Giandomenico, Ron Divincenzo, Willie Quinn, Jim Higgins, John Dooley, Dan Ronan, Rich Brennan, Peter Fish, (new Dad--Congrats!) Mike Sylvia , Brian McConnell, Brad Zancanaro, Mark Hetnik, Matt Marden, Stephan Siewiec, Ed Ronan, Dennis O'Connell, Frank D'Orio, Scott Manty, Steve Smolinsky, and Brandon Yip. 2011 Cason Hohmann’s first goal of the of the season was the game-winner in Cedar Rapids’ 7-2 win over the NTDP U17s. Hohmann added an assist as did the U17s Alexx Privitera, a 2011 recruit. 2010 recruit Matt Nieto banged home the game-winner early in the third period as the U.S.NTDP U18s beat Cornell in Ithaca tonight, 3-2. Last night, he recorded three assist in the U18s 10-1 win over Utica College on Friday Night. Mike Grier scored his third goal of the season in the Sabres' 3-2 (a popular score tonight!) overtime win over Tampa. Matt Gilroy’s 2nd goal of the year, a slapper from the blueline, gave the Rangers an early 3-1 lead, but the Canadiens roared back to win in overtime, 5-4. Terriers are back on the ice tonight facing their second consecutive CCHA opponent, Michigan, in a 7 p.m. start at Agganis Arena. Judging from some of the comments in an AnnArbor.com game preview article, the Wolverines have revenge on their minds, recalling last year's 7-2 defeat at the hands of the Terriers. From GoTerriers.com, we have game notes with links to Gametracker, the radio broadcast on WWZN and the online telecast on All-Access (subscription). For a look at the Wolverines, USCHO's season preview. Click here for the Free Press's Boston Hockey Blog live blog. Sean Sullivan’s hot start for San Antonio earned a recall to Phoenix. The top-scoring defenseman for the Rampage last season, Sullivan was also named the AHL Player of the Week for the week ending Oct. 11, 2009. He joins former Terrier Adrian Aucoin in the Coyotes blueline corps. Phoenix takes on the Kings tonight. Scott McLaughlin of The Daily Free Press previews tomorrow’s matchup with CCHA power Michigan and has updates on Grant Rollheiser and Ross Gaudet who have been inactive due to injuries. USCHO’s Scott Weighart reports that sales of “Burn the Boats” have been strong. In addition to online availability, the books will be sold again at the Agganis Arena concession stand during tomorrow night's matchup with the Wolverines. Between 6 and 7 p.m., Scott will be signing copies of the book at a table near the concession stand. The books are selling for $17 each and $7 of each copy purchased at Agganis Arena will go to the BU hockey program. NHL announcer Mike Emrick, a recipient of the Lester Patrick Award and the NHL Hall of Fame’s Foster Hewitt Memorial Award, is the narrator of Rival Films production of “The Battle of Commonwealth Avenue,” which documents the BU-BC rivalry. The program will air on NESN on November 25 and on the NHL Network in March. In the video clip below, Emrick talks about the ancient rivalry, the atmosphere at Walter Brown Arena and, in particular, a BU-BC game he called for CSTV in Dec. 2004, during the NHL lockout, which became Jack Parker’s 700th career win (video highlights). Emrick did the visiting team play-by-play of last night’s Rangers-Devils game at Madison Square Garden. During the Rangers broadcast, Matt Gilroy was interviewed and video clips were shown of the game-tying goal against Miami in the NCAA final and of Gilroy’s parents, Frank and Peg, unfurling the NCAA championship banner on Oct. 10. Adrian Aucoin’s overtime goal last night pulled the Coyotes past the Redwings, 3-2, and earned the former BU blueliner first-star honors. Aucoin, who assisted on Phoenix’s first goal, carried the puck out of his end, crossed into the offensive zone and beat Chris Osgood with a 55-footer. Colin Wilson made the scoresheet for a second night in a row, assisting on Nashville’s first goal in a 6-5 win against Ottawa. Former Terrier top scorer Colin Wilson picked a familiar place to register his first NHL goal last night: the TD Bank Garden in Boston where Wilson appeared in the Beanpot and Hockey East tournaments the past two seasons. The scoring play began with a heavy check by Wilson in his own end to cause a turnover and it finished with Wilson banging home a loose puck in the Bruins' crease (video). Wilson earned the game's third star, but the Bruins topped Nashville, 3-2. Also last night, former BU All-American Mike Grier got the Sabres off to a fast start, beating former BC goalie Scott Clemmensen (video) just 1.11 into the first period, as the Buffalo dumped Florida, 5-2. In the AHL, David Van der Gulik pick up a pair of assists in Abbotsfords' 5-3 win over Toronto. VDG has a 1-6-7 line in 8 games for the Heat. During last night’s home opener against Notre Dame, BU had no shortage of grade A chances to score, but despite hitting iron three times and getting two clean breakaways, the Terriers couldn’t put one past netminder Brad Phillips, who stopped 34 shots. The result was a 3-0 shutout loss and the first time BU failed to score in a game since Feb. 2007’s scoreless tie with Lowell, snapping a nation's-longest, 99 game streak. Terriers had the better of the play through much of a scoreless first 35 minutes, but in the 36th minute, Notre Dame scored twice. Then, in the third period, immediately after a Chris Connolly shorthanded breakaway resulted in no shot on goal, the Irish added a third goal. BU pressured the rest of the way, but to no avail. BU, which outshot Notre Dame 34-16, lost the faceoff battle by an equally lopsided 35-18 margin. Game coverage includes recaps from USCHO, The Daily Free Press, The Boston Globe and Inside Hockey, along with a comprehensive box score. We have audio below of Coach Parker’s post-game comments, many of which are in the USCHO recap. Video highlights. ► Four members of last year's team were at the game: Brandon Yip, recovering from an injury, John McCarthy, Steve Smolinsky and Colin Wilson, who will skate for the Predators tonight against the Bruins. ► Former Terrier Paul Fenton, now assistant general manager of the Nashville Predators, has been named an assistant coach for Team USA in the Deutschland Cup tournament, set for Munich early next month. The roster is made up of Americans playing professional hockey in Europe and includes Fenton's son PJ, who played college hockey for Don Cahoon at UMass. Along with a scouting report on Notre Dame (below), GoTerriers.com has links to game notes, gametracker, the Internet radio broadcast on WWZN and the All-Access Internet video broadcast. The game also airs on ESPNU and will be broadcast on WTBU. Daily Free Press game preview. The USCHO Weekly Poll has BU ranked third and Notre Dame ranked ninth. • Notre Dame (2-2-0) will be playing its first road game of the season after splitting two-game home series with both Alabama-Huntsville (Oct. 9-10) and Providence (Oct. 15-16). • The Irish dropped their season opener to the Chargers by a score of 3-2 before rebounding with a 3-1 victory the following night. The Friars also struck first, earning a 3-2 victory over Notre Dame on Thursday before being shut out by the Irish, 2-0, on Friday. • Senior Kevin Deeth is the team's early leader in points with four - all assists - and enters Tuesday's contest with 99 career points. Highly touted freshman Kyle Palmieri has three points on two goals and an assist. • Notre Dame's defensive corps is led by junior Ian Cole, a first-team AHCA All-American last season. • The Irish have already had three starting goaltenders this season, as the team looks to replace graduated senior Jordan Pierce, who earned a nation-best 30 wins last season and ranked second in goals-against average (1.68). Junior Brad Phillips has suffered both losses in goal this season, while senior Tom O'Brien backstopped the team to its win over the Chargers and freshman Mike Johnson stopped all 29 shots he faced to earn the shutout in his collegiate debut against Providence on Friday. • Jeff Jackson is in his fifth year as head coach of the Fighting Irish and his career winning percentage of .716 (287-102-39) is the highest of any coach with five or more years at the Division I level. He has a record of 105-50-14 (.663) at Notre Dame and has led the Irish to at least 31 wins and the NCAAs in each of the last three seasons. the entire team was there, enthusastically greeting walkers as participants entered Suffolk Downs for the walk. The players handed out information about the walk and along with up-to-date information that families dealing with autism need. Several of the players were sporting temporary tattoos of the Autism Speaks logo. In addition, the players revealed that the annual Autism Family Day will be held Walter Brown Brown Arena on Sunday February 21, 2010 as the Women's team takes on Maine. Every year, the BU Men's Hockey Team hosts young people with autism and their families at a BU Women's game. Photo (from left to right) - Victor Saponari, Joe Pereira, Zach Cohen, Grant Rollheiser. The Fighting Irish make their first-ever visit to Agganis Arena tomorrow night. It will be just the third time BU and Notre Dame have met and the first time in a non-tournament setting. The Terriers beat the Irish during the 1970-71 season at the Boston Arena Christmas Tournament and did so again during the 1995-96 campaign in the Badger Showdown in Madison. Few college hockey fans would have guessed that tomorrow’s home opener at Agganis Arena would match these highly regarded teams with a combined 2-3 record. Notre Dame, 2-2 after splitting two-games series with UA-Huntsville and Providence, faces the 0-1 Terriers. The South Bend Tribune offers this preview. The Terriers have slipped to 5th in the INCH power rankings, while the Fighting Irish dropped to 9th. From The Daily Free Press, we have another recap of Friday night's 3-2 loss to UMass. The Freep also looks at a silver lining to the opening game loss--the strong performance of the newly formed Wade Megan-Corey Trivino-Alex Chiasson line, which accounted for both Terrier goals. Chiasson was recognized as one of the week's top performers in the Hockey East weekly news release. 2010 recruit Yassin Cisse, a 6-3, 208 right wing, scored his first goal of the season in Des Moines’ 5-3 win over Youngstown in USHL action. Former BU blueliner Adrian Aucoin scored his first goal of the season in the Coyotes 4-1 win against Boston. Saturday. Another former Terrier defenseman, Sean Sullivan, in his third full pro season, is tied for third in AHL scoring with a 2-8-10 line in 8 games for the San Antonio Rampage, Phoenix's affiliate. Both goals were overtime winners. BU Today profiles former BU co-captain and netminder Brian Durocher, now coach of the Terrier Women’s team, which is ranked 10th with a 2-0-3 record. The Terriers earned a 4-2 win against Wayne State Saturday night on the strength of Jenelle Kohanchuk’s four-goal game, first ever for the women’s program. Eleven month after dealing the Terriers their second and last road loss of the 2008-09 season, the UMass Minutemen again used timely scoring and strong goaltending by Paul Dainton to upend BU at the Mullin Center in Amherst, 3-2. UMass scored the only goal of the third period, despite being outshot 16-4 in the period and 41-26 for the game. For the Terriers, besides not having to return to Amherst again this season, the positives were led by freshman Alex Chiasson scoring a pair of goals in his first college game and a strong overall game from the third line of Corey Trivino, Wade Megan and Chiasson. We have a recaps from GoTerriers.com, Hockey East Online , College Hockey News, and MassLive.com and a comprehensive boxscore. The Boston Hockey Blog provides post-game notes and coach’s comments, as well as Sarah Gordon's photo gallery MassLive.com photo gallery. ►Remember that state from last season—that BU never lost a game in which Nick Bonino had at least one point? It still applies as the junior center was kept off the scoresheet, despite taking seven shots. ► Freshman defenseman Sean Escobedo's first period slapper hit the crossbar and dropped behind Dainton, but a video review showed the puck had not crossed the goal line. 2011 recruit defenseman Alexx Privitera scored his second goal of the season in the NTDP U17s' 4-2 loss to Sioux City in USHL play. With exhibitions completed, BU treks down the Pike to Amherst and a season-opener against UMass. The Mullin Center has been a challenging venue in recent years for the Terriers, who have a “slight 4-3-2 edge” in the past nine games in Amherst. The teams split the two games played there last season. As always, GoTerriers.com has a gameday post with links to Links to game notes, radio broadcast on WWZN.com, Gametracker and the UMass All-Access site (where you can purchase the game for $8.95) . WTBU also is streaming the game live and The Daily Free Press's Boston Hockey Blog will be live blogging throughout the game. The Daily Free Press spoke with Coach Jack Parker about what to expect from the hosts tonight and some areas where he’d like the Terriers to improve over last Saturday’s effort. The Freep also offers an overview of the 2009-10 Terriers. MassLive.com previews the game from the Minutemen’s point of view and USCHO provides its analysis of the 2009-10 UMass team. From HockeyBuzz On Campus, we have video highlights of UMass’ opening win over RPI last weekend. Boston Globe columnist Bob Ryan welcomes the start of the college hockey season and takes note of the fact that the NCAA trophy resides in Boston for a second consecutive year. For NHL.com’s On Campus feature, Bob Snow spoke with Coach Jack Parker about his long career behind the Terriers’ behind and his intention to continue in that role. Commenting on his relationship with his players, Parker said: "I have two daughters and 200 sons. We are family and we do go through a lot together over the relationship. Frankly, that's the best part of the job." "Of all the coaches I have ever played for, he is the best at preparing a team for one big game. He made us believe that we were going to win that title. "He is not only a great coach, but a great person, and he knows how to be your coach when you are in the locker room or on the ice, but he is a friend when you are away from the rink, and he knows how to separate the two, which to a player is important." A day before the Terrier’s opening game of the season against UMass, the Daily Free Press profiled two keys to the team’s fortunes in the defensive end of the ice: sophomore goalie Kieran Millan and junior captain and defenseman Kevin Shattenkirk. Robenhymer was at Agganis Arena Saturday developing a feature on the U.S. National Team Development Program that will be posted on Versus in November. HockeyBuzz on Versus has begun a NHL Rookie Diaries series that will include Nashville's Colin Wilson, whose buddy James VanRiemsdyk, now with the Flyers, is featured in the current offering. First year Avalanche coach Joe Sacco, a 28-goal scorer for BU in 1989-90, has Colorado in first place with a 4-1-1 record. Des Moines -- Yasin Cissé: At 6-2 and 205 pounds, the Westmount, Que., native certainly doesn't lack size. Prior to the 2008 Quebec Major Junior Hockey League draft, the International Scouting Service regarded Cissé the best warrior, second-best hitter and second-hardest player to compete against. "Yasin has very good skills and good skating acceleration," said Pierre Leduc, director of hockey operations for the QMJHL. "He's strong on the boards, loves to forecheck and completes his checks. Maybe he likes to give more than receive, but he's big and has great skills." As a 15-year-old, he would always rely on his skills and huge frame, but he's discovering it takes a lot more against equally skilled players. "I found out that if you work your hardest and you want to win more than anyone else, then the points will come," Cissé told The Gazette of Montreal. "It's the guys who think about the points that don't get them." The QMJHL's Lewiston MAINEiacs drafted Cissé in the second round after he was the top rookie scorer in the Quebec midget AAA ranks in 2007-08 with 20 goals and 58 points in 44 games. Cissé and Louis Leblanc, the 18th pick of 2009 draft by the Montreal Canadiens last June, led the Lions to the Quebec AAA midget finals. But Cissé never reported to Lewiston, and instead began making plans to attend Boston University. In his first season with Des Moines in 2008-09, Cissé had 2 goals, 8 points and 46 penalty minutes in 31 games. Also profiled in the article was NTDP U18 goalie Jack Campbell who stopped 39 BU shots is last week’s exhibition game, won by the Terriers, 3-2. Finally, this has no connection to BU hockey, but check out the goal by a 9-year-old in the Boston Bruins TD Bank Mini 1-on-1 competition. As Gary Thorne of ESPN might say, "Unbelievable!" It all began over breakfast at T. Anthony’s. It was the summer of 2004, and I was still working in the Terrier athletic department. As had been my custom since being named the sports information director in 1977, I ventured up Babcock Street to Comm Ave. and headed to T Anthony’s for breakfast. There, to my surprise and delight, sat old friend Larry Cancro, who is now the Boston Red Sox Senior Vice President of Fenway Affairs. He had stopped at T’s before going to work and was enjoying his breakfast. I had known Larry for nearly 30 years and was convinced there was no greater Terrier hockey fan anywhere. His love of Terrier hockey dated back to his days as a BU undergraduate. A 1977 graduate, he covered the Terrier hockey team for the Daily Free Press. He was good friends with Mike Eruzione and Ricky Meagher. If anything, this bond has grown stronger over the years. I remember back in the late Seventies sitting in my office after Terrier hockey games and getting calls from Larry. At the time, he was working for the Atlanta Braves and he wanted a full report on how the team did that night. The call from Atlanta would come in around 11:30 pm and we would talk for at least on hour…all about the Terrier hockey team. On this particular morning more than five years ago, I joined Larry for breakfast at T. Anthony’s, and as you can imagine, talk was directed about the hockey team. “Coach (Parker) is looking for a charity for the team to support,” I reported to him. “What about autism?” Larry asked. It did not surprise me that Larry would respond that way, for one of his daughters, Lisa, was diagnosed with autism when she was an infant. Today, she is 19 years old and still suffers from this dreaded disorder. “Why don’t you write a letter to the Coach and suggest it?” I said. “I will,” he countered. And, the rest, as they say, is history. Over the years, the Terriers have been actively involved supporting Autism Speaks. On occasion, they have donated the 50-50 raffle held at each BU home game to Autism Speaks. Announcements are made regarding Autism Speaks at Terrier games and during radio broadcasts on WWZN. BU players have given their time to enhance the lives of others through special projects like the installation of a playground (photo) at Melmark, New England, a school specializing in autism. They've also hosted children that have autism and their families at some of their practices and at BU Women’s Hockey games. And, the Terrier have been involved with the Autism Walks. Which brings us to the point of this story. This Sunday, October 18th, the 9th Annual Greater Boston Walk Now for Autism will be held at the Suffolk Downs Racetrack in East Boston. The Terrier hockey team will be there. Not as walkers but as major helpers to make sure the event is run smoothly. Organizers expect more than 530 teams to show up and more than $650,000 has already been raised. YOU CAN DO YOUR PART BY SUPPORTING A TERRIER HOCKEY PLAYER AT THIS EVENT. From this page, select your favorite player or players, or if you so choose, make a general donation in the name of the Terrier hockey team. Even though the hockey players aren’t committed to walking around the mile-and-a-quarter track, they will be there representing the team, and the team’s commitment to Autism Speaks. “It seems natural that the hockey team would be involved with Autism,” said Cancro, who among his other responsibilities is Chairman of Autism Speaks New England. “Boston University is one of five schools in the country that coordinates autism research in the United States. And, as a result, the University receives grants from Autism Speaks. “Nineteen years ago, when my daughter was born, one in 10,000 youngsters were diagnosed with autism. Today, according to the CDC (Center for Disease Control), one in 150 youngsters are diagnosed with autism. “And, Autism Speaks specializes in care and research of autism and provides information for families who have autistic children. “I will be forever indebted to Coach Parker and the Terrier hockey team for all they have done over the years,” concluded Cancro. Larry Cancro is doing is part for Autism Speaks. Jack Parker and the Terrier hockey team are doing their parts for Autism speaks. NOW YOU CAN DO YOUR PART FOR AUTISM SPEAKS. Click here to learn more about Autism Speaks and then donate on behalf of your favorite Terrier hockey player. Thank you!!!! "Burn The Boats," the chronicle of BU's 2008-09 championship season, is again available for online sales at www.buhockeybook.com, following a brief interruption. Author Scott Weighart reports that the technical issues that briefly suspended the availability of the book have been resolved. The offer of free shipping for the first 35 days of the regular season still applies, and it is expected that the book will be available for sale at Agganis Arena next Tuesday during the home opener vs. Notre Dame. Every purchase at Agganis Arena will benefit the Friends of BU Hockey. For each $17 book that is bought, $7 will go to the Friends in honor of the seven championships that the Terriers won last season. Just as they did during BU's 2006-07 season, John Curry and Brian Strait are teamed to keep pucks out of their net. Only now they're doing it for the Wilkes Barre/Scranton Pens. ► Lake Erie Monsters Coach David Quinn needed reinforcements on the blueline, so the Avs' AHL affiliate recalled former BU defenseman Kevin Schaeffer from ECHL/Charlotte. Tonight, Schaeffer found himself going up against his one-time defensive partner, Sean Sullivan who recorded an assist in San Antonio's 4-1 win over the Monsters. Former Terrier and Hobey Baker Award finalist Colin Wilson, recovered from an injury, made his NHL debut last night in the Predators 6-1 loss to the Edmonton Oilers in Nashville. Wilson didn't figure in the Nashville goal but earned kudos from Coach Barry Trotz. Wilson was interviewed after the game by PredsOnTheGlass. We've added a new entry in the list of links in the sidebar to the right. It's for the WTBU Sports Web site where you'll find articles and interviews, including this recent conversation with BU captain Kevin Shattenkirk. Also note that we've added 2009-10 Game Highlights to the list of Video Highlights. Click there to see a longer video of the banner-raising than we posted on Sunday. And check out The Daily Free Press coverage of Saturday's pre-game ceremonies. According to U.S. Hockey Report, BU is among the leading contenders for AJHL/Canmore Eagles goalie Sam Brittain (6-3, 219). He'd be for the 2011 recruit class (Millan and Rollheiser's senior year). Chief competitiors are Denver, Wisconsin and UNO. Sahir Gill, the Chicago Steel highly regarded left wing mentioned in an earlier blogpost, has narrowed his choices to BU, Northeastern, Minnesota and North Dakota, according to Amateur Hockey Report's Paul Shaheen. Click here for his full article. "Burn the Boats" author Scott Weighart’s USCHO recap along with a Jim Connelly sidebar on the banner-raising ceremonies. South Shore Kings’ 10-game unbeaten streak was ended by the N.H. Monarchs, but 2010 recruit Charlie Coyle collected his 6th goal of the season for the Kings to go with 18 assists. 2011 recruit Cason Hohmann picked up his first point in USHL regular-season play in Cedar Rapids’ 3-1 win over Sioux City. Also in the USHL, 2010 recruit Yasin Cisse returned to the Des Moines lineup after missing the preseason and first two regular season games with an injury. John McCarthy, co-captain of the 2008-09 Terriers, picked up his first AHL goal on Friday in Worcester’s shootout loss to Bridgeport. 2008-09 assistant captain Brian Strait's first AHL point came in Wilkes Barre/Scranton’s 4-2 win over Syracuse. Baby Pens netminder John Curry stopped 26 of 28 shots. Chris Bourque, acquired by the Penguins just before the season began, made his first start for the Stanely Cup champs against Phoenix. The Terriers played their final exhibition game before 5403 fans and edged the USA Under 18 team 3-2 in a spirited though sometimes sluggish contest. It was a special evening as the 2009 NCAA Title team was commemorated with parents of our departed players playing a role in the unveiling of the Beanpot, Hockey East Regular Season, Hockey East Championship, Frozen Four, and NCAA Championship banners. 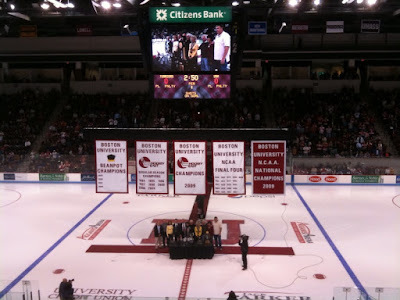 BU Athletics has posted a video of the final unveiling, that of the 2009 NCAA Championship banner, which you can view below. In addition, LTC Scott Williams, Army ROTC professor administered the oath of office to several incoming cadets. The student section roared their approval with chants of "USA, USA" raining down as they left the ice. The ROTC color guard presented the colors for the national anthem in their usual superb fashion. Then it was time for hockey. 51 seconds into the contest a Zach Cohen bid was stopped by USA net minder Jack Campbell who would face 42 shots this evening. The Terriers dug an early hole as Alex Chiasson was called for a slash at 53 seconds and Vin Saponari was whistled for roughing after checking goalie Campbell) at 1:49. USA team capitalized at 2:01 as Justin Flak found the range with a bullet from the left point. Future BU Terrier Matt Nieto had one of the assists. BU tied it at 12:07 as Nick Bonino took the puck from the left wing low circle around the net and beat Campbell with the wraparound inside the post. Zach Cohen and Vinny Saponari had the assists.With BU a man up Chiasson was denied from the left corner of the net but Chris Connolly found the range on a wrister from the RW dot high to the glove side of Campbell with Max Nicastro and David Warsofsky assisting. Terriers had the edge in shots 15-4. Period two appeared to be somewhat lethargic and team USA took some of the air out of the building with a powerplay goal at 10:54 shortly after Chiasson was hit with an elbowing penalty. Brandon Saad found the range from the right side just off the net in deep assisted by Austin Czarnik and Derek Forbort. At 16:09 Kieran Millan came up big as Saad stripped a defender of the puck at the BU blueline and walked in alone. Millan stayed with him and foiled his effort. Terriers got the eventual game winner at 19:51. Joe Pereira using Andrew Glass as a decoy on a 2 on 1 beat Campbell stick side from inside the LW circle. Glass and Luke Popko assisted. Shots on goal were BU 10 and USA 7. Adam Kraus took over for Millan in period three and held USA scoreless while making 5 saves. Shots were BU 17 and USA 5. Total shots on goal were BU 42 and Team USA 16. Team continues to work on its chemistry and coaches are looking for the right combinations. Freshmen remain works in progress but should only improve as time goes on. Future Terriers did not look out of place in the team USA lineup. Former Terriers in attendance included: Andy Warren, Brad Zancanaro, Tom O'Regan, Brian Collins, Pat Aufiero, Travis Roy, Mark Hetnik, Brian McConnell, Steve Smolinsky, Matt Marden, Peter Fish, Chris Mays, Peter Donatelli, and Frank D'Orio. One other Terrier spotted shall remain nameless for security reasons. Apologies to any I missed especially UMass coach Don Cahoon who I am told was scouting from on high. Terriers open the regular season next Friday as they visit the Minutemen in Amherst. Q—Chris, you’re not the first Terrier from Minnesota. John Curry, Ryan Priem and Justin Maiser are a few of those who preceded you here. So what brought you to BU? A—I grew up in Duluth, Minnesota and had only experienced the Midwest (Omaha and Fargo), so I wanted something completely different for my college experience. I came on my visit out to Boston already knowing how accomplished both the coaching staff and program itself were, but I also fell in love with the city. Q—Your younger brother Jack was also a freshman last year at Minnesota-Duluth in your hometown. Did you have any interest in joining him with the Bulldogs? A—Yes I did. It was a very difficult decision for me to turn down my home town University, especially having the chance to be a freshmen with my younger brother; but at the same time, I had also been on my own for a few years playing juniors so leaving home wasn’t an issue for me. The opportunity to play for such an historic program was too good to pass by. GoTerrier.com has links to an audio interview with Jack Parker, for listening to Saturday’s exhibition game vs. the NTDP U18s on WTBU and for watching on All-Access. BU Today reports on the banner raising ceremonies that will precede the exhibition and offers a highlight video of the Terrier’s title run. USA Hockey previews the NTDP U18s weekend in Boston meeting BU and BC. USCHO’s Dave Hendrickson and Jim Connelly preview Hockey East and take a look at the 2009-10 Terriers. ESPN.com’s David Albright picks the Terriers to retain the Hockey East crown. USCHO’s initial national poll has Denver on top with the Terriers a close second. Upcoming opponents Michigan, Notre Dame and Cornell are 3rd, 5th and 7th respectively. The Hockey News talks with Nashville rookie Colin Wilson, skating again after an injury, and his coach, Barry Trotz. In a USA Junior Hockey Magazine cover story about the rise of the South Shore Kings, Coach Scott Harlow voices high expectations for 2010 recruit Charlie Coyle. Terrier freshman blueliner Ben Rosen led the Kings in scoring last year and sophomore Kevin Gilroy was their top goal-scorer the previous year. Last year's BU co-captain Matt Gilroy also is a Kings alum. As for Coyle, Harlow coached him for five years with the South Shore Dynamos youth team. Coyle committed to the Terriers last year while playing for Thayer Academy. The East Weymouth, Mass., resident simply wanted to prepare for Terrier hockey by playing against the best competition available for his age group in the Eastern U.S.
At least a dozen regular-season Terrier games will be telecast this season on two outlets: NESN and ESPNU. In addition to its usual second semester package of Hockey East broadcasts, NESN will air three games during the first semester for a total of nine regular-season games. If BU reaches the Beanpot title game, that will be a 10th NESN game. ESPNU’s schedule of college hockey games includes three BU contests, beginning with the home opener on Oct. 20 against Notre Dame. In addition 12 home games will be streamed online through the All-Access service (subscription details), including Saturday’s exhibition game. GoTerriers.com news release. TV & Internet schedule. On the radio side, Bernie Corbett celebrates his 25th year as the "Voice of the Terriers." Former BU captain Tom Ryan is back to do color for the broadcasts on WWZN 1510-AM and WWZN.com . ►Hockey on Campus, the only national college hockey program featuring players, coaches and fans, is back for another season. Hosted by Bernie Corbett and former Princeton standout Paul McNamara, Hockey on Campus is on the Web for three hours every week from this month through the Frozen Four with podcasts and video interviews. The first program is scheduled for October 28. There now is a link to Hockey on Campus in the sidebar to the right and we’ll post alerts to each week’s program scheduled guests. ►The Daily Free Press previews Saturday night’s exhibition game against the U18s, preceded by the raising of the NCAA Championship banner. 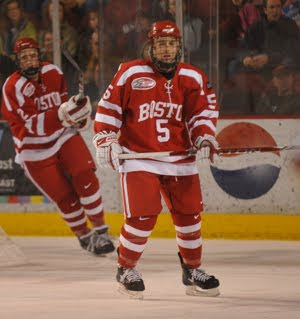 The game will give BU fans their first look at the newest members of the 2010 recruit class, defenseman Adam Clendening and left wing Matt Nieto. ►The Salem News spoke with Chris Higgins who begins his pro career in Syracuse with the AHL Crunch . ►The Medford Transcript traces the path that took local hero Joe Sacco to BU and the NHL, where he now become the third ex-Terrier to serve as an NHL head coach. The first two were Steve Stirling and Mike Sullivan. ►With many teams beginning their regular-season schedules this weekend, polls and prediction abound. NHL.com picks the Terriers to win the Hockey East title and ranks them third in the nation. In his conference preview INCH’s Jeff Howe, who also ranks BU first, projects Nick Bonino for top player and Alex Chaisson for top newcomer. NHL Fanhouse’s Bruce Ciskie, a veteran observer of college hockey, lists Bonino and Captain Kevin Shattenkirk among Hockey East’s best performers. Chris Dilks of the Western College Hockey Blog takes on some of the claims made Canada Major Junior teams in battles with NCAA college for top recruits. With a bit of research, Dilks deflates the major junor teams' arguments. 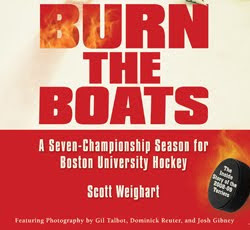 USCHO senior writer Scott Weighart reports that his new book about BU's championship season--"Burn The Boats"--is now available for purchase online. It will be on sale on this Saturday at Agganis Arena during the Terriers' exhibition game against the NTDP U18s as well. Scott has provided us with an excerpt of the book and the news release that follows below. 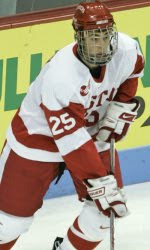 Brookline, MA – Mosaic Eye Publishing is pleased to announce the publication of Burn The Boats: A Seven-Championship Season for Boston University by Hockey by US College Hockey Online senior writer Scott Weighart. With in-depth reporting of events both on and off the ice, the book chronicles all of the key events from the last loss of the disappointing 2007-08 season through the celebratory aftermath following the Terriers’ astonishing comeback win in the 2009 national championship game. Available at a price of $17, the book initially will be available for purchase through mail order at www.buhockeybook.com as well as at Agganis Arena. • Individuals who donate a minimum of $300 this year to the Friends of BU Hockey will receive a free copy of the book. Contact the Friends of BU Hockey at 617-353-3008 for more details. • For others, there is a special, limited-time offer with mail order. In honor of BU’s 35-win season, Mosaic Eye is offering free shipping and handling on all orders made during the first 35 days of the regular season. This applies only to orders shipped within the United States. • When the book is available for sale at Agganis Arena, every purchase will benefit the Friends of BU Hockey. For each $17 book that is bought, $7 will go to the Friends in honor of the seven championships that the Terriers won last season. For more information about the book, including an excerpt and advance praise by Nancy Marrapese-Burrell of The Boston Globe, go to: www.buhockeybook.com. A new DVD, produced by Rival Films, examines college hockey's greatest rivalry: BU vs. BC. "The Battle of Comm. Ave," which features game footage and interviews with players, coaches and fans, looks at the history and intensity of the competition, which began in 1918, between the two schools that share the same street, just a few miles apart. The production will air on NESN in November; however, the DVD includes a director's cut with an additional 32 minutes of footage. Details and a link for ordering online are here. A pre-sale discount price of $7.50 is available through Friday, October 9. The subject of that headline is 5’11”, 182 lb. left wing Matt Nieto (see Media Guide, pg. 20) of the U.S. NTDP U18 Team who has committed to Boston University, joining the growing 2010 recruit class. 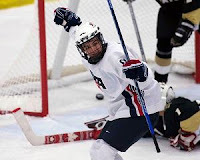 USHR went on to describe Nieto (photo from USA Hockey), who led the NTDP in scoring last season with 67 points (26-41) in 64 games, as “an explosive skater and a gifted goal scorer and playmaker.” He had made an unofficial visit to BU last season. Nieto, whose hometown is Long Beach, Calif., began last season with the U17s, scoring 53 points (20-33) with 22 PIMs in 51 games, before being called up to U18s along with Adam Clendening, who verballed to BU on Sept. 25. Nieto added 14 points (6-8) in 13 games. In the World U18 championship, he tallied four goals in seven games, registering a plus-five rating as Team USA earned the gold medal . [Note: In 2006, Colin Wilson moved up to the U18s from the U17s to help Team USA win gold in the World U18s.] His 41 total assists is 8th best for a season in the NTDP. Nieto continues the long line of NTDP players who have become Terriers, including current captain Kevin Shattenkirk, Colby Cohen, Luke Popko and David Warsofsky. 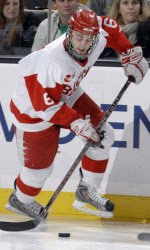 He also shares a connection with numerous current (Shattenkirk, Cohen, Corey Trivino, Alex Chiasson) and future Terriers (Cason Hohmann and Robert Porsello), having played for the East Coast Selects' ’92 tournament squad. ►Nov. 2008 USA Hockey.com feature on Nieto.